Transdermal patches are basically medication delivery systems that can be attached to the skin to deliver a controlled release of drugs into the skin and then into the bloodstream. As a form of nicotine replacement therapy, nicotine transdermal patches are used to help in smoking cessation. There are multiple layers in transdermal patches: the adhesive, the membrane, the release liner, and the backing. The adhesive sticks the patch to the skin; the release liner protects the drug formulation and the adhesive and is removed before application; the membrane layer (or layers) contains the drug and regulates the rate of diffusion of the drug out of the patch and into the skin; and the backing is the outermost layer of the patch and guards the formulation while the transdermal patch is worn. The composition of a transdermal patch should be known to achieve product improvement and quality control, and to track the mechanism of drug release. Usually, conventional methods of analysis are destructive, either requiring physical cross-sectioning of the patch (for example, TEM, SEM) or dissolving the sample for extraction (for example, GC-MS, LC-MS). Now, with the help of confocal Raman analysis provided by the Thermo Scientific™ DXR™2 Raman Microscope, the layers of a commercially available transdermal nicotine patch were assessed without causing any damage to the sample. First, a sample of transdermal nicotine patch was placed onto a gold-coated microscope slide, with the release liner at the bottom and the backing layer facing the microscope objective. Raman confocal area depth profiling and line depth profiling were then carried out with a DXR2 Raman microscope (Figure 1) using 50x objective, 532 nm laser, 5 mW laser power at the sample, and 25 μm confocal pinhole aperture with auto exposure (S/N = 200). For the area depth profiling, a vertical X-Z area of 120 μm (X) by 245 μm (Z) was examined by using a 20 μm step size along the X-axis and a 5 μm step size along the Z-axis. For the line depth profiling (Z-profiling), a 5 μm step size (containing 45 points or spectra) was used to probe a depth of 220 μm. The area contains 350 spectra or points. In order to associate an optical image with the Raman profile, a tiny cross-sectional piece of the nicotine patch was placed vertically on the glass slide. Data collection, processing, and analysis, such as identification of the layer composition and estimation of the layer thickness, were done using the Thermo Scientific™ OMNIC™ for Dispersive Raman Software Suite, which comes with Thermo Scientific™ OMNIC™ Atlμs™ Software. 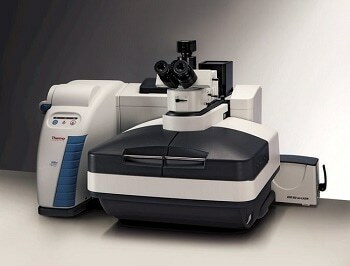 The Thermo Scientific OMNIC Specta Software was used to perform multi-component spectral analysis. Figure 2a depicts a Raman line depth profile map acquired using the OMNIC software suite. The depth profile in the figure is shown in a 2D contour map and reveals the variations in the Raman peaks (vertical lines) as the focal point probes through the layers. Furthermore, the rainbow color scheme of the 2D contour map reveals the intensity of the Raman peaks as color, with blue indicating the lowest intensity and red denoting the highest intensity. There were a total of six layers with thicknesses ranging from ~15 μm to ~75 μm. Each layer’s thickness was measured using the full width at half maximum (FWHM) value method given in the Thermo Scientific Application Note 517181. The optical image of the physically cross-sectioned sample is shown in Figure 2b, providing a visual representation of the thickness of the layer based on contrast. Although the optical image is similar to the chemical image, some of the layers cannot be identified easily. Shown in Figure 3 is the representative Raman spectra for each layer in the Raman line depth profile. In order to identify the chemical composition of each layer, a library search was performed against the Thermo Scientific High-Resolution Raman Polymer Library using OMNIC software. Image 2. (a) Raman line depth map (Z-map) for the transdermal nicotine patch. The dashed white lines indicate the approximate depth of each of the six layers. (b) An optical image of the cross section. Image 3. Representative Raman spectra for each layer of the patch. Layer 1, that is, the backing, is composed of poly(ethylene terephthalate) or PET. Layers 2 and 4 are composed of microporous polyethylene (PE) that serves as a controlled release agent for nicotine; the nicotine is located at the ethylene/vinyl acetate (EVA) co-polymer reservoir layer (Layer 3). Layer 5 is composed of PET and a polyisobutylene (PIB) adhesive, and Layer 6, that is, the release liner, is composed of PET. As shown in Figure 4, the OMNIC Specta software using the Multi-Component Search option was employed to identify the presence of nicotine in the EVA reservoir layer (Layer 3). Thanks to the patented Multi-Component Search, one can detect components in mixture samples without the laborious manipulations demanded by the conventional search and subtract processes. The search identified the S-(-)-nicotine as the second component (green in Figure 4), besides the EVA (orange), and also gave the composite value (%) of the two constituents. The composite value is a scaling factor that indicates the amount of each found reference denoted in the composite spectrum. However, it should be remembered that the composite values cannot be taken as materials’ quantitative percentage, which needs to be measured by a primary quantitative analytical method. Image 4. OMNIC Specta Multi-Component Search identified the presence of (S)-(-)-nicotine (~36%) in addition to the EVA co-polymer in Layer 3. Shown in Figure 5 are correlation profile images acquired from the Raman confocal area depth (X-Z) profiling of the same nicotine patch sample. The association between the map spectra and the reference Raman spectrum of each layer was used to obtain each of the images. The images depicting the red color indicate the highest correlation to a particular reference spectrum, while blue indicates no correlation. For instance, a single red colored layer is shown by the EVA + nicotine correlation image (Figure 5, right), suggesting that this layer has maximum correlation to the EVA + nicotine reference spectrum, thus demonstrating that this is the layer where these two constituents are located. Within these images, the presence of six layers is found to be consistent with the results of the confocal line depth profile analysis (Figure2). The X-Z correlation images also show the relatively uniform thickness of the layers. Image 5. X-Z correlation profile images generated by the reference Raman spectrum of each layer. Current methods for studying multilayer polymers like transdermal nicotine patches are tedious and time-consuming, and they also tend to damage the sample. With confocal Raman analysis, the analysis is fast and sample integrity is also maintained. Using OMNIC for Dispersive Raman and OMNIC Specta software suites, the chemical composition of each layer was established. The components in Layer 3—a mixture of nicotine and an EVA co-polymer—was identified by OMNIC Specta Multi-Component Library Search. Detection was easier than the tedious manipulations needed by conventional search and subtract processing. 1. Guillory P., Deschaines T., Henson P. Confocal Raman microscopy analysis of multilayer polymer films, Thermo Scientific Application Note 51718, 2008.